For many companies, bringing in qualified talent involves an outdated formula. This involves pricey setup, overwhelmed staff frantically collecting piles of resumes, limited space, restricted venue hours and administrative nightmares- not the prettiest sight. Incidentally, the candidate experience doesn’t fare much better either with long waiting times in queues to meet hiring managers, impersonal exchanges with recruiters, and a nagging element of rush to cover as many booths as possible. As the age old saying goes, time is money, and money is time. This is exactly why in this age of automation, Career Fairs are in dire need of a facelift to kick ROI up a notch. Finding the right employer-employee match has traditionally been seen as a Herculean task, but with the right tools and innovation to back up your event, streamlining your talent acquisition processes becomes easily possible. There are multiple ways to get creative with your Career Fairs; to help you get started, we’ve put together a list of solutions that streamline talent acquisition and attract job seekers that you’ve been missing out on all this time. There are chances that you’ve heard of this already, but we’ll reinforce this further- a virtual Career Fair is the cream of the crop when it comes to automation. By hosting an online event that replicates many aspects of the traditional fair in a 3D setting, you can look forward to tremendous cost savings, massive global outreach and distraction free one-on-one communication with applicants alongside many other add-ons such as CV shortlisting tools, on-the-spot video interviewing, and round-the-clock event hosting convenience. All that your attendees need to access the event is a laptop (or mobile device) and an internet connection; there’s no need to travel or stand in long queues. The virtual Career Fair can run for days enabling talent to apply for jobs without having to race against time. vFairs is a leading virtual event platform that excels at providing Career Fair solutions with maximum impact and engagement. Their team of expert project managers handle all planning, management and setup on behalf of the host, so all you have left to do is sit back and experience the luxury of exceptional talent populating your database from around the world. 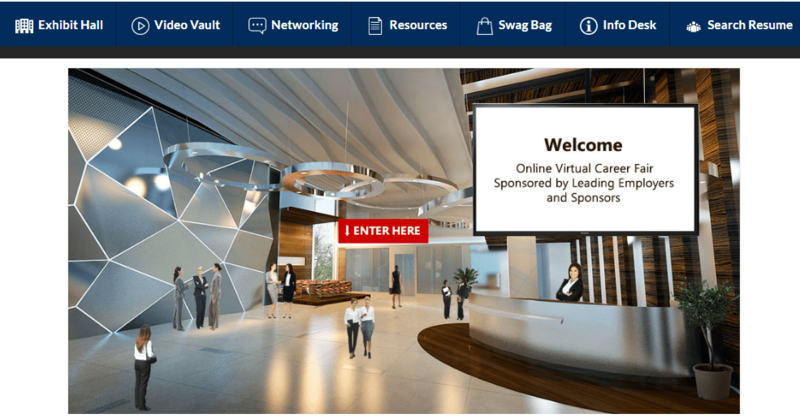 If you’re hesitant to go fully virtual with your Career Fair, you can ease into the technology shift using a hybrid event. You can complement your physical event with a custom branded event page to share valuable resources such as webinars highlighting company culture, multimedia content, interviewing advice, best resume writing practices, etc. so your visitors arrive at the Career Fair well equipped with the knowledge to make a great first impression. What’s spectacular about this approach is that you can spearhead inclusivity and accessibility for your visitors; using Web Content Accessibility Guidelines (WCAG) you can target an extended volume of talent by providing special features on your event page. From visual impairment to hearing disabilities, you can leave a brilliant mark on your exhibitors and attendees alike by ensuring equal opportunities for all, and dignified share of information for all job seekers to benefit from. To help free up time on recruiter’s schedules, utilizing technology to streamline CV collection and sorting can be a strong game changer. Instead of cumbersome paper-based CV exchanges between HR executives and candidates, a sure shot way to improve the event experience for all attendees is by incorporating smart CV capturing tools. ScanShake’s mobile app is an excellent tool to overcome the hassles of managing paper-based resumes, manual data entry woes, and painfully slow shortlisting decisions that add no value to the recruitment cycle. It supercharges recruitment efficiency by enabling instant CV capture via QR codes with an abundance of other nifty features. Recruiters can tag and “star” candidates of interest for immediate shortlisting, and with every exchange being tracked and reported, it provides a comprehensive snapshot of Career Fair metrics, top recruiters, vacancies available, in-demand candidates, and overall success. Low attendance is a fear most hosts experience, however with the right premarketing efforts you can proactively ensure that your Career Fair is a magnet for job seekers. Building your brand visibility and awareness is not an overnight mission, this is why we recommend using dynamic landing pages use as your marketing sidekick. Use it as a functional registration page and share all event related details including schedule, exhibitor details, and other resources. Allowing candidates to have early bird access to this information will help serve as a bait so that they can reduce your administrative hurdles at the event, meanwhile enabling you stay in control of the content and any last minute changes to ensure it’s accurate, uniquely branded, and most importantly- social media friendly. Pre-collecting candidate CVs can be a great time saver for recruiters, this is made possible by including digital CV Kiosks at your next event. With easy and quick to fill customizable forms, employers can zoom-in on collecting CV data that is of utmost important to their recruitment needs. Self-serviced and interactive, they are a valuable asset to help keep track of event traffic, and empower recruiters to invest their time towards building meaningful relationships with attendees instead of rushing through conversations due to high booth traffic. The Career Fair landscape is changing; using the right automation tools to attract, engage and hire the best talent has become undeniably streamlined. With slick solutions that efficiently build potential employee pipelines, provide detailed analytics, and create the right buzz to boost branding and deliver fantastic user experiences, giving your event strategy a makeover is a definite key to success. Whether you go fully virtual or hybrid, invest in instant CV collection or digital kiosks, we’re confident that you will appreciate the new and improved bang for your buck.